Today we release SongKong 1.26 this has a number of refinements to the matching process, testing has shown some very nice improvements to matching accuracy and coverage. There are also some nice improvements to Match to Recording Only section of the report, and I thought I would use this as an opportunity to explain this section further. Songs are usually distributed as a release, be it an album, a compilation , an e.p. or a single the songs is part of a larger release. This also applies to digital downloads, although it is easy to purchase tracks they are still distributed as part of a release - even if the release is just a one song digital single. Your songs for that release are distributed over multiple folders and you have Only allow match if all songs in folder match to one album enabled. The songs length is incorrect because it has been badly ripped. Only allow match if all songs in folder match to one album are enabled we don't do this. and the song is considered unmatched for the purposes of renaming songs so that if some songs in a folder are matched to a recording and some are not they do not get split up. The Recording Only section of the report shows these matches. Originally SongKong simply listed the songs that were matched per artist in alphabetical order. But this was not very easy to decipher as a SongKong user myself I found I wanted the songs grouped by existing album name, this then helped me pinpoint problem recordings that were not matched often explaining the reason why the group of songs not matched to an album in the first place. 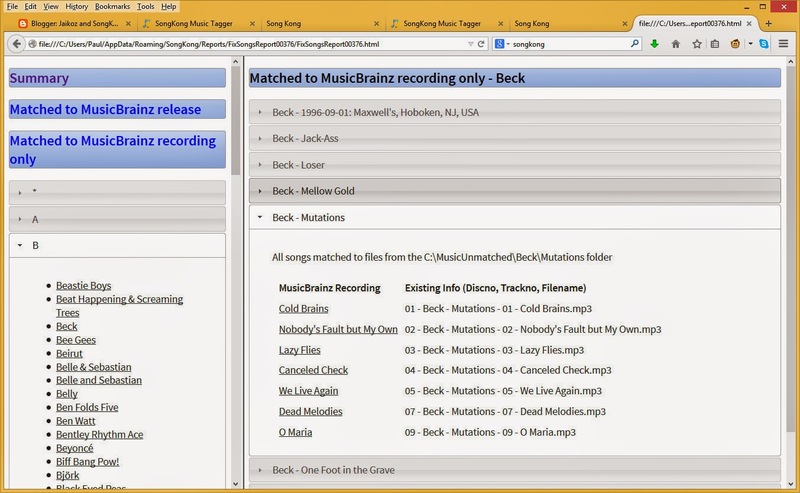 The MusicBrainz Recording shows the song titles that the songs have been matched to, clicking on a title will take you to the MusicBrainz page for that recording. The Existing Info (Discno, TrackNo, Filename) column shows just that if they exist. Remember Match to Recording Only doesn't add release specific information like Disc No or Track No so these values are only shown if the song already contained them in its metadata. In this screenshot we see that songs did have Track No set but not Disc No set, so only track no and filename is shown. Songs are grouped by existing release title of it exists, not the folder. So if two songs from different folders with the same value for artist and release are matched this means they will be listed in the same section. Whereas two songs in the same folder with different values for release would be listed in different sections.